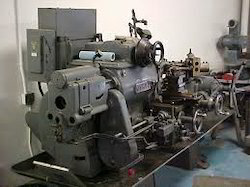 Prominent & Leading Manufacturer from Rajkot, we offer turning lathe machine. Used for the purpose of cone turning, grooving, parting, drilling, or boring, Turning Lathe is one of the most popular products from our range of products. This product is manufactured using high quality raw materials and several modern machinery. It is made available in the market at a very reasonable rate making it a highly demanded product. The offered product is provided by us in various specifications as per the needs of the clients. This product is known for its efficiency, sturdiness, and durability. Looking for Turning Machine ?